man it's was pouring buckets out this morning! It was also stop and go traffic down el camino on my way to work at 9am. Some of the traffic lights were malfunctioning which was causing the slow down. On the plus side, ervy has his antibiotics so he hopefully won't get infecto finger. Also, the doctor didn't make him fill out any paperwork on the animal bite which is WONDERFUL. I was worried about the hassle of quarantine and what not for asha. She's been such a cuddle bear lately. Fuson was over for Buffy thon this past weekend and she was loving sitting in his lap getting rubbed and scratched. I first saw these on Jacqueline's blog when she was comparing the difference between US smarties (those sugary/chalky rolls you get in grab bags at halloween) and Canadian Smarties (more like M&M's). I had to try them since I found them. They're larger than M&M's, more like the size of a US nickel. And the candy shell is very strongly fruit flavored. Not any specific fruit that I can tell, just fruit flavored. I find them very odd to eat. Not too much knitting going on since yesterday (being Vday and what not). I started on the strap for my fry up purse. I'm doing a garter stitch band 6 stitches wide on size 8 needles. This is the yarn I started spinning last week while my friends were over. 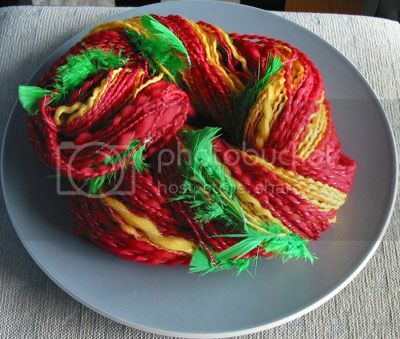 It turned into a gorgeous brightly colored tropical yarn. looks like some sort of tropical flower or drink, no? The size of a nickel? Were these made in Canada or Britian? Wow. Although it is really cool that you found them. I am - seriously - far, far too in love with that wool. It makes me think of margaritas. umm that yarn.. makes me want to make something and go to south america! it totally ROCKS!! Are my eyes fuzzy or what? I seem to see feathers in the yarns!!! We have Smarties in HK too ... I don't know if they are different from those here, though. Gosh but that is gorgeous yarn! I'm seeing parrots flying about and drinks with little umbrellas in them for sure. LOVE the yarn - great job with that - I'd like to try spinning soon. Thanks for visiting my site! I didn't do TOO much damage during the no-tax weekend in NYC! Hi Lori, Thanx for visiting my site! I'm really enjoying the Bay Area knitters ring..It's awesome to read local knit bloggers. that yarn is simply yummy! Jacqueline, you are so right! The tube is nickel sized, the candy itself is dime sized. Glad you all like the yarn. There are green feathers in it, don't worry, your eyes are working Agnes!